The holiday season is here and as a parent of a threenager walking by the toy section, I’ve felt the uptick in newly created characters, bulky packaging, and bold design. Manufacturers know this is prime list-making time and it seems this year, their look-at-me tactics are at an all-time high but, if you’re like me and have bought the fad toys before, you know the gimmicks lose their shine as quickly as they acquired it. So, what’s the solution when gifting season is in full swing? This year, rather than forking all our money over to big toy companies, let’s aim to keep our dollars in Saskatchewan, buying locally and mindfully. Babies might not know what presents are all about but they sure love wrapping paper and bows! Tucking a membership to the Western Development Museum or gift certificate for infant music classes at We Move SK into a bag full of repurposed, baby-safe packing materials makes for a fun unwrapping of a gift that keeps on giving. For older babies, a silicone and wood teether like the one Little Chomperz crafts is a gift they’re guaranteed to sink their teeth into or, if you want to keep those little hands occupied, a sensory blanket like The Knotty Button tag toy is just the thing. And if you have a baby that’s always on the go like my little Paris, betcha nothing sounds sweeter to you than a busy board—D & B’s makes eye-catching ones that live up to their name. When I was a kid, squishy boxes weren’t my #1 to open but go figure, clothing is my daughter’s favourite gift! If you too have a kiddo whose hobbies include ripping off tags and trying things on right now, there are a zillion makers you need to know in this town! We love Rain Melody, ForEverly Yours, Pink Threaded Owl, and how cute are the pom beanies from Mod Knots Design? Of course, as a parent who wants things to actually get worn, I also love minimal design that can be paired with anything in my childrens’ wardrobes so these geometric harems from beck+bean are a total win. For the youngest set, stay-on booties complete an outfit and there are options galore at King’s Castle. Saskatchewan is an incubator of the arts (possibly due to winters that lend themselves to hibernation) and as a result, we’re home to many fabulous authors and musicians. My daughter, Petra has asked me to read Alice Kuipers’ “Polly Diamond and the Magic Book” so many times, I am starting to know it by heart… and so is she! For pre-readers, “Land of Living Skies” by Linda Aksomitis, “Sundog Rescue” by Allison Lohans, and “Honoring The Buffalo: A Plains Cree Legend” by Judith Silverthorne are all beautiful choices or, pop into McNally Robinson and inquire about local children’s authors—there are many titles available at the prairie bookseller. If you’ve got a budding audiophile, pick up a children’s album by Brenda Baker, Singing With Sylvia, or head upstairs to the vinyl diner and ask for a great local band that your kiddo can groove to. It’s never too early for rock ‘n’ roll. It wouldn’t feel like Christmas without toys and activities hidden under the tree and if your child enjoys costume play the way Petra does as Owlette, you need to know M&R Creations. From Paw Patrol and adorable animals to Mario and classic superheros, these handmade felt masks are a sure-fire hit. 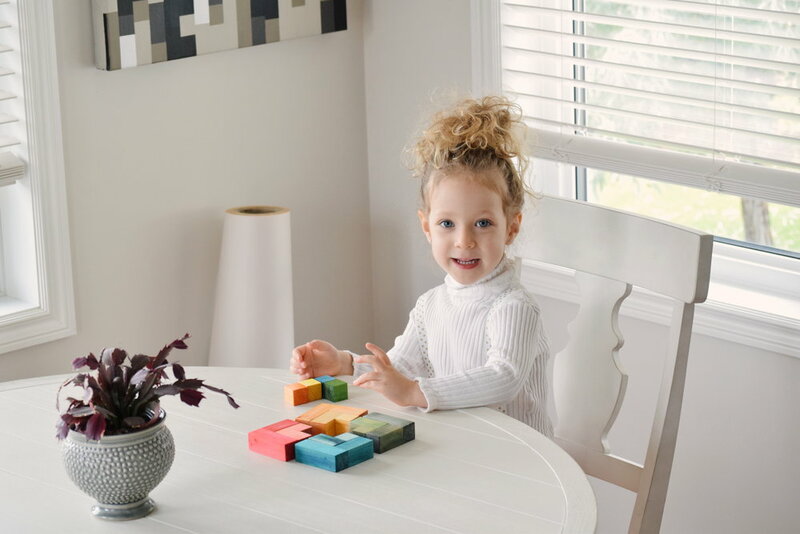 For the creative mind, a Waldorf Square puzzle like this one from Blissful Baby Boutique offers your child the freedom to form 3D artwork with beautiful colours and angles—Petra seems hypnotized as she creates new permutations. Another colourful favourite is bath bombs and with ABC Averi’s Bath Collection Minis, not only are they economical compared to the big bombs but that they’re packaged in a jar that can be repurposed for canning. For the mermaid-obsessed, Polka Dots and Lady Bugs makes the prettiest tails complete with scales and spreadable fins (pictured above as Petra reads her favorite book) and, bonus, there are matching mermaid dolls available in any skin tone and hair colour. I can’t forget fans of battle bots, who’ll flip over a real combat robot kit from Fingertech, available with various add-ons. For young kids, you’ll help with the build, gifting a bit of quality time alongside the bot. I hope you’re feeling inspired to see what our talented citymates are making—there are so many places to look. Featured here are King’s Castle, Joyne, and Fingertech but you can also find local treasures at The Farmer’s Market, Very Happy Toys, Hen & Chick Studios, Handmade House, The Better Good, pop-up markets, and more. It’s up to you to explore! Have a favourite Sask-made toy, clothing line, or other giftable? Leave it in the comments and share the love.